As a property manager or building owner, you take great pride in the visual appeal of your facility. From the front doors to restroom sinks, every aspect of your building should look great to reflect the level of quality you place on your brand. If your walls have seen better days, though, it can be hard to keep your company’s interior looking great. As Illinois’ go-to drywall company, AZ Drywall Finishing is here to provide turnkey wallboard solutions to keep your facility’s new and existing walls looking great for a long time. For nearly 20 years, our drywall contractors in Chicago have worked diligently to deliver the most durable and affordable outcomes for our happy clients. From framing to finishing to acoustical ceilings, our commercial drywall company is here to meet your needs. We are here to help with your drywall installation, but we cannot be there 24/7 to protect your walls from damage. 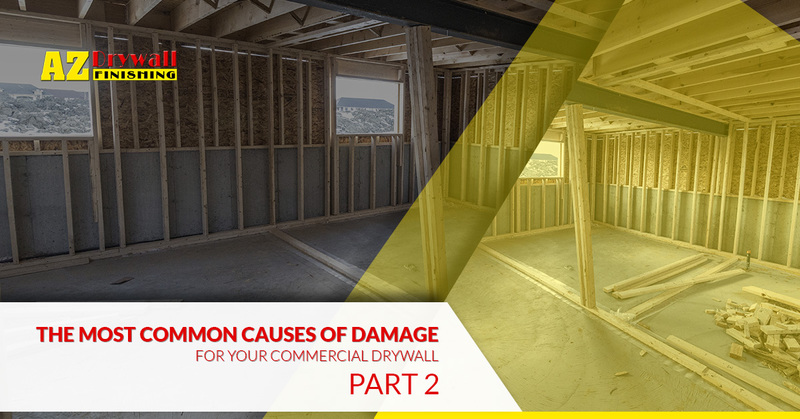 Today, we’ll continue to discuss the most common causes of damage to industrial drywall, and go over a few tips that may help to mitigate future problems. If your facility is in need of wall-to-wall services, be sure to reach out to the AZ team for assistance! One common problem that can quickly disrupt the visual quality of your drywall is the range of small holes that can develop in an instant. Normally, this comes in the form of impacts from doorknobs, minor scrapes, and even nails. These can all add up to create unsightly areas in your building. If certain corridors in your facility are constantly suffering from these holes, it can help to reinforce problem spots with a backing or additional protection. Inserts are available for foot traffic, while stops are available for knobs and doors. From equipment impacts with your hallway to Steve tripping and falling into the wall, major holes can create major aesthetic problems for your business. Unfortunately, there are not many measures available that can help you to avoid big holes from happening. While rare, the risk is always present for major drywall damage to occur. If you have noticed a pattern of incidents regarding trips or collisions with the walls, it may prove helpful to implement changes that can further minimize the chances of a damaging outcome. Cutting and removing the old wallboard and installing new drywall is the best approach for holes that are large enough to make minor patches impractical. Our drywall company is here to serve as your experts for the best outcomes from wall to wall. In most high-traffic applications, a 90-degree metal strip is placed on the corners of drywall and hidden beneath the joint compound. This corner bead is used to create a seamless surface along the corners that are protected from impact. Over time, collisions with the corner bead can lead to unsightly dents and uneven edges. The added protection of this strip is matched by the involvement needed for repairs. In most cases, you will need to utilize a saw to remove the dented section, replacing it with new corner beading and securing it with screws. After applying the compound and sanding, the new corner will be ready to be painted. Our drywall finishers excel in creating seamless outcomes for businesses of all sizes and styles. Joint compound can be applied in thicker lawyers when utilized with joint tape. Your joint compound can only withstand so much force placed on each independent panel, and without joint tape support, your material can quickly turn to dust. While useful for creating durable and even finishes, joint tape can lose its adhesion when exposed to small amounts of moisture. Loose tape creates a serious problem for your building’s visual quality, as this aesthetic problem is hard to miss. When this happens, you can find cost-effective drywall repairs that work to cut out the old tape, placing new tape in its stead and priming it for a coat of paint. Joint tape problems are hard to avoid, but solutions are typically fast and painless. From hanging the studs to installing drywall, the creation of your building’s interior relies on quality for the best long-term outcomes. If your building is in need of facelift, our commercial drywall company can help. AZ Drywall Finishing is proud to be a drywall company in Illinois, delivering high-quality results that are tailored to deliver the best outcome for your budget. If you’re in need of an experienced team of drywall contractors in Chicago, be sure to reach out to us for your estimate today!